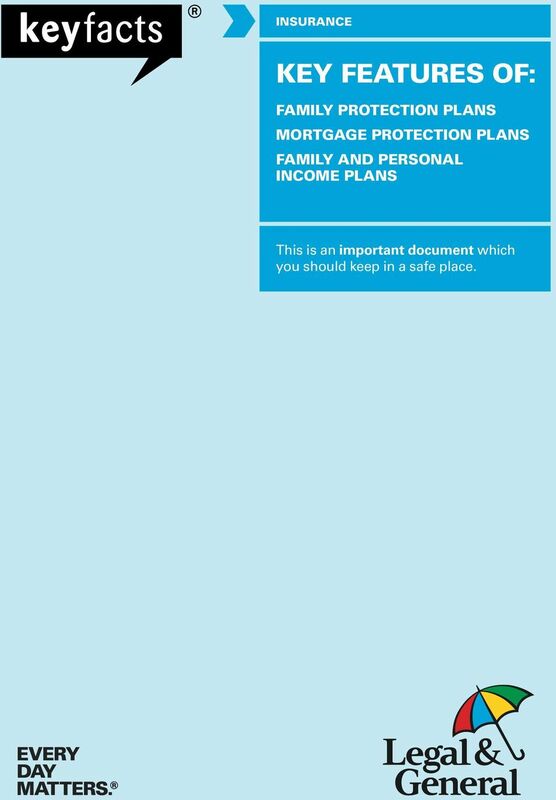 Download "KEY FEATURES OF: FAMILY PROTECTION PLANS MORTGAGE PROTECTION PLANS FAMILY AND PERSONAL INCOME PLANS"
1 INSURANCE KEY FEATURES OF: FAMILY PROTECTION PLANS MORTGAGE PROTECTION PLANS FAMILY AND PERSONAL INCOME PLANS This is an important document which you should keep in a safe place. 2 2 LEGAL & GENERAL PROTECTION PLANS KEY FEATURES USING THIS DOCUMENT. WHAT ARE KEY FEATURES? 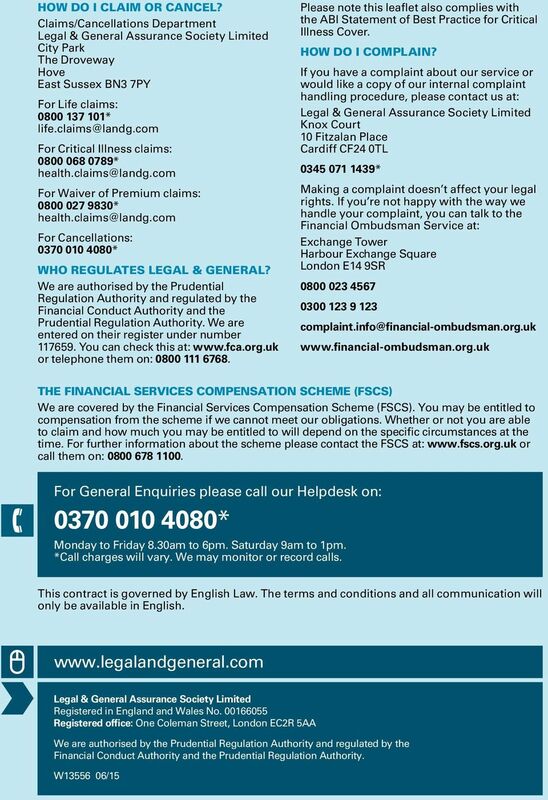 The Financial Conduct Authority, the independent financial services regulator requires us, Legal & General, to give you this important information to help you decide whether our Mortgage and Family Protection Plans or our Family and Personal Income Plans are right for you. You should read this document carefully so that you understand what you are buying, and then keep it safe for future reference. OTHER DOCUMENTS You should read this document alongside your Personal Illustration. You can also ask for: A copy of the Policy Terms and Conditions; and/or Our Guide to Critical Illness Cover (if relevant). 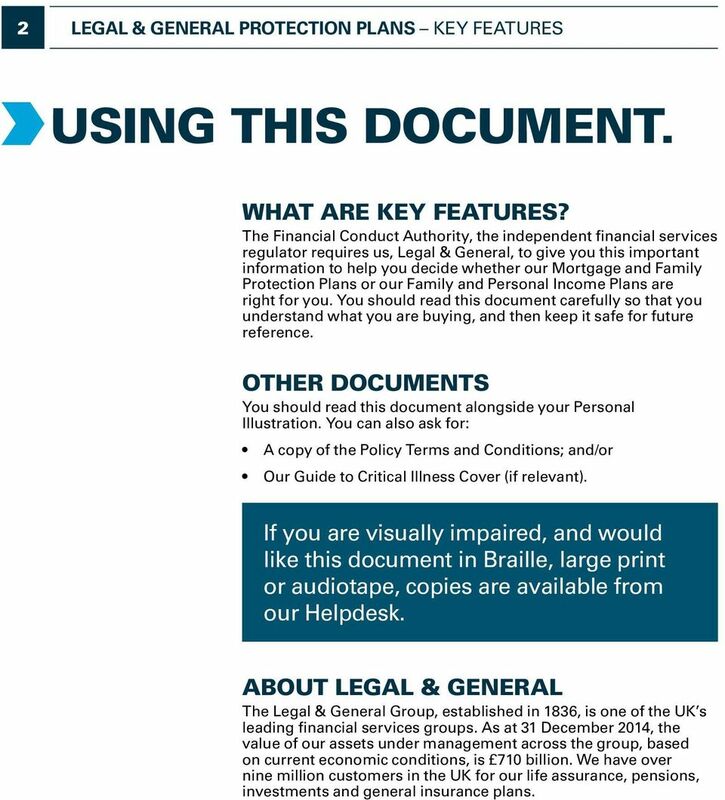 If you are visually impaired, and would like this document in Braille, large print or audiotape, copies are available from our Helpdesk. ABOUT LEGAL & GENERAL The Legal & General Group, established in 1836, is one of the UK s leading financial services groups. As at 31 December 2014, the value of our assets under management across the group, based on current economic conditions, is 710 billion. We have over nine million customers in the UK for our life assurance, pensions, investments and general insurance plans. 3 LEGAL & GENERAL PROTECTION PLANS KEY FEATURES 3 AIMS Our protection plans are designed to help protect against the impact of death, terminal illness or critical illness (if chosen) on you and your family. Your policy could be used to help pay off your outstanding mortgage or to help protect your family s lifestyle and everyday living expenses. 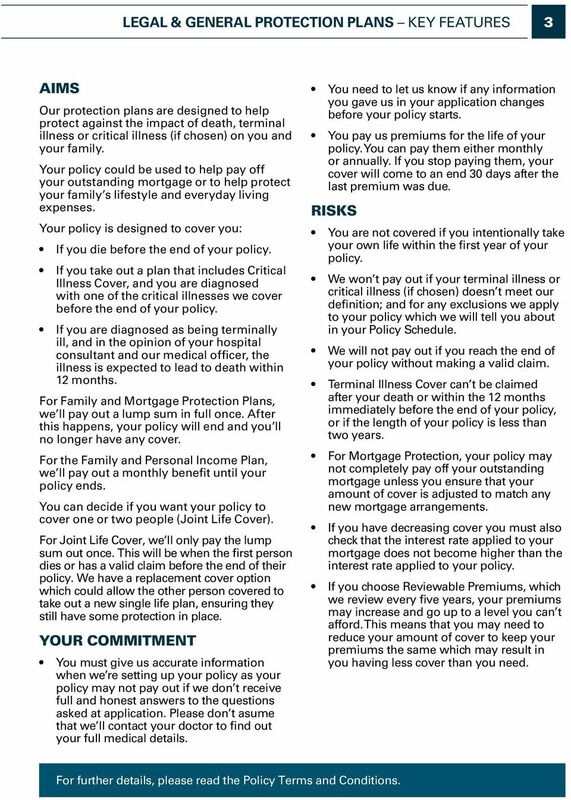 Your policy is designed to cover you: If you die before the end of your policy. If you take out a plan that includes Critical Illness Cover, and you are diagnosed with one of the critical illnesses we cover before the end of your policy. If you are diagnosed as being terminally ill, and in the opinion of your hospital consultant and our medical officer, the illness is expected to lead to death within 12 months. For Family and Mortgage Protection Plans, we ll pay out a lump sum in full once. After this happens, your policy will end and you ll no longer have any cover. For the Family and Personal Income Plan, we ll pay out a monthly benefit until your policy ends. You can decide if you want your policy to cover one or two people (Joint Life Cover). For Joint Life Cover, we ll only pay the lump sum out once. This will be when the first person dies or has a valid claim before the end of their policy. We have a replacement cover option which could allow the other person covered to take out a new single life plan, ensuring they still have some protection in place. YOUR COMMITMENT You must give us accurate information when we re setting up your policy as your policy may not pay out if we don t receive full and honest answers to the questions asked at application. Please don t asume that we ll contact your doctor to find out your full medical details. You need to let us know if any information you gave us in your application changes before your policy starts. You pay us premiums for the life of your policy. You can pay them either monthly or annually. If you stop paying them, your cover will come to an end 30 days after the last premium was due. RISKS You are not covered if you intentionally take your own life within the first year of your policy. We won t pay out if your terminal illness or critical illness (if chosen) doesn t meet our definition; and for any exclusions we apply to your policy which we will tell you about in your Policy Schedule. We will not pay out if you reach the end of your policy without making a valid claim. 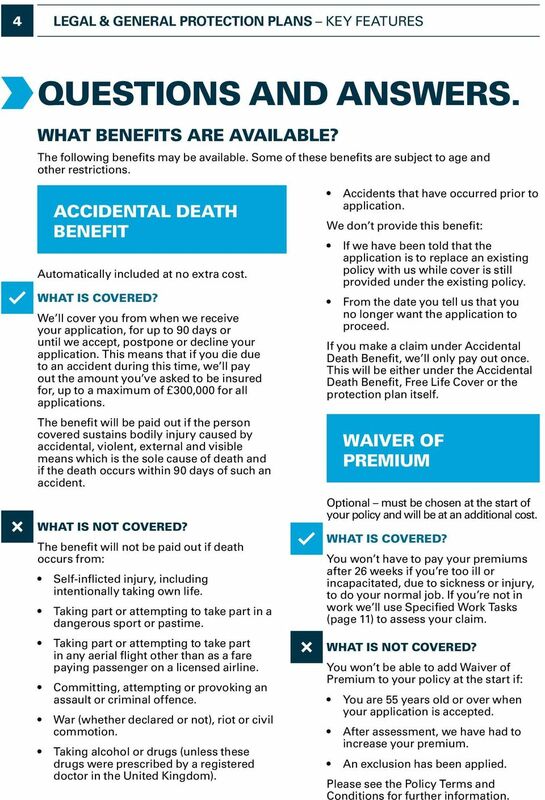 Terminal Illness Cover can t be claimed after your death or within the 12 months immediately before the end of your policy, or if the length of your policy is less than two years. For Mortgage Protection, your policy may not completely pay off your outstanding mortgage unless you ensure that your amount of cover is adjusted to match any new mortgage arrangements. If you have decreasing cover you must also check that the interest rate applied to your mortgage does not become higher than the interest rate applied to your policy. If you choose Reviewable Premiums, which we review every five years, your premiums may increase and go up to a level you can t afford. This means that you may need to reduce your amount of cover to keep your premiums the same which may result in you having less cover than you need. For further details, please read the Policy Terms and Conditions. 4 4 LEGAL & GENERAL PROTECTION PLANS KEY FEATURES QUESTIONS AND ANSWERS. WHAT BENEFITS ARE AVAILABLE? The following benefits may be available. Some of these benefits are subject to age and other restrictions. ACCIDENTAL DEATH BENEFIT Automatically included at no extra cost. We ll cover you from when we receive your application, for up to 90 days or until we accept, postpone or decline your application. This means that if you die due to an accident during this time, we ll pay out the amount you ve asked to be insured for, up to a maximum of 300,000 for all applications. The benefit will be paid out if the person covered sustains bodily injury caused by accidental, violent, external and visible means which is the sole cause of death and if the death occurs within 90 days of such an accident. The benefit will not be paid out if death occurs from: Self-inflicted injury, including intentionally taking own life. Taking part or attempting to take part in a dangerous sport or pastime. Taking part or attempting to take part in any aerial flight other than as a fare paying passenger on a licensed airline. Committing, attempting or provoking an assault or criminal offence. War (whether declared or not), riot or civil commotion. Taking alcohol or drugs (unless these drugs were prescribed by a registered doctor in the United Kingdom). Accidents that have occurred prior to application. We don t provide this benefit: If we have been told that the application is to replace an existing policy with us while cover is still provided under the existing policy. From the date you tell us that you no longer want the application to proceed. If you make a claim under Accidental Death Benefit, we ll only pay out once. This will be either under the Accidental Death Benefit, Free Life Cover or the protection plan itself. WAIVER OF PREMIUM Optional must be chosen at the start of your policy and will be at an additional cost. You won t have to pay your premiums after 26 weeks if you re too ill or incapacitated, due to sickness or injury, to do your normal job. If you re not in work we ll use Specified Work Tasks (page 11) to assess your claim. You won t be able to add Waiver of Premium to your policy at the start if: You are 55 years old or over when your application is accepted. After assessment, we have had to increase your premium. An exclusion has been applied. Please see the Policy Terms and Conditions for further information. 5 LEGAL & GENERAL PROTECTION PLANS KEY FEATURES 5 INDEXATION CONVERSION OPTION Optional must be chosen at the start of your policy. Indexation is designed to protect your policy against inflation. Every year, we ll give you the option to increase the amount you re insured for (up to a maximum of 10%), in line with any changes in the Retail Prices Index (RPI)* without the need for further medical evidence. Your premium will increase at a different rate to your amount of cover because it s indexed by the change in the RPI multiplied by 1.5 up to a maximum of 15%. This takes into account the fact that the likelihood of claiming increases as you get older. If changes to the RPI are 1% or less then both your premium and amount of cover will stay the same until the next review. * The Retail Prices Index is a way of measuring the impact of inflation on family budgets and is published by the Government. If you decide at review not to increase the amount you re insured for, we won t offer you this option again. You won t be able to add Indexation to your policy if when you applied for your policy we had to increase your premium. If you choose Decreasing Cover or the Conversion Option you cannot take the Indexation Option. Optional must be chosen at the start of your policy and will be at an additional cost. This lets you convert your Life Cover into the Whole of Life Protection Plan, without having to give us any more medical information. This means that your Life Cover can carry on for the rest of your life. You must use this option before your 60th birthday. You won t be able to add the Conversion Option to your policy: If you are 55 years old or over when your application is accepted. If the length of your policy is less than 10 years. 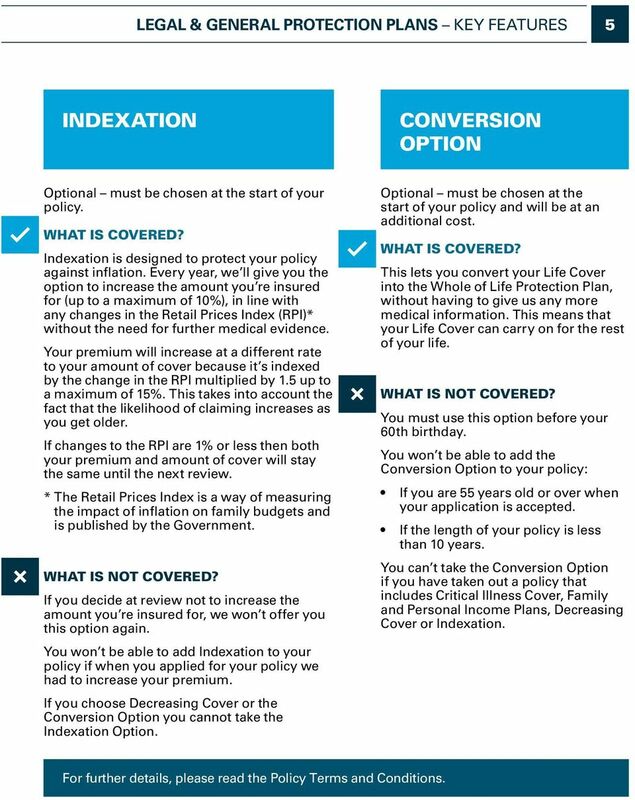 You can t take the Conversion Option if you have taken out a policy that includes Critical Illness Cover, Family and Personal Income Plans, Decreasing Cover or Indexation. For further details, please read the Policy Terms and Conditions. 6 6 LEGAL & GENERAL PROTECTION PLANS KEY FEATURES MORTGAGE PROTECTION PLANS ONLY. If you are taking out a mortgage protection plan to help pay off an outstanding mortgage, you will need to choose between Level or Decreasing Cover. Level Cover provides the same lump sum throughout the length of your policy. For Decreasing Cover, the amount of cover reduces roughly in line with the way a repayment mortgage decreases. Your premiums will remain the same during the length of your policy unless you make any changes. If you choose Decreasing Cover, your amount of cover for Terminal Illness Cover and/or Critical Illness Cover (if chosen) will also decrease. You need to ensure that your amount of cover matches your outstanding mortgage. Your policy may not completely pay off your outstanding mortgage, if you: Change the mortgage you have in any way and you don t adjust your cover or length of policy to match your new arrangements. Choose Decreasing Cover and the interest rate on your mortgage becomes higher than the rate applied to your policy. 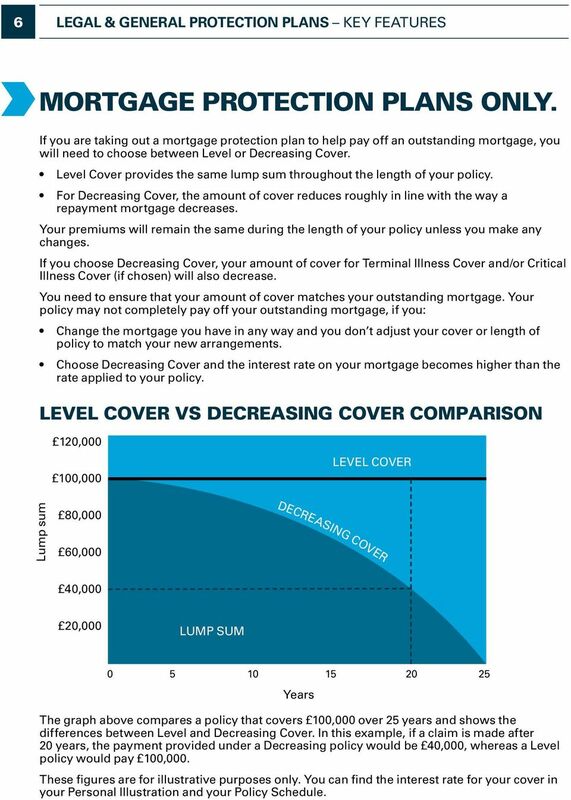 LEVEL COVER VS DECREASING COVER COMPARISON 120, ,000 LEVEL COVER Lump sum 80,000 60,000 DECREASING COVER 40,000 20,000 LUMP SUM Years The graph above compares a policy that covers 100,000 over 25 years and shows the differences between Level and Decreasing Cover. In this example, if a claim is made after 20 years, the payment provided under a Decreasing policy would be 40,000, whereas a Level policy would pay 100,000. These figures are for illustrative purposes only. You can find the interest rate for your cover in your Personal Illustration and your Policy Schedule. 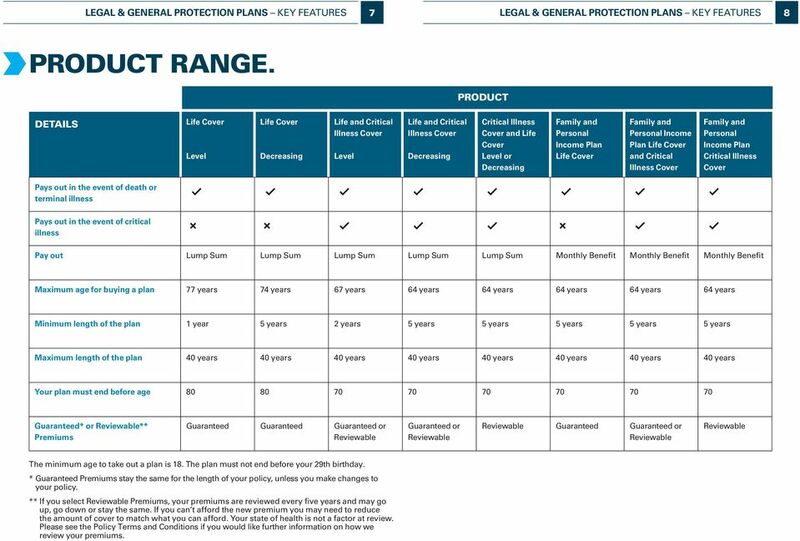 7 LEGAL & GENERAL PROTECTION PLANS KEY FEATURES 7 LEGAL & GENERAL PROTECTION PLANS KEY FEATURES 8 PRODUCT RANGE. PRODUCT DETAILS Life Cover Level Life Cover Decreasing Life and Critical Illness Cover Level Life and Critical Illness Cover Decreasing Critical Illness Cover and Life Cover Level or Decreasing Family and Personal Income Plan Life Cover Family and Personal Income Plan Life Cover and Critical Illness Cover Family and Personal Income Plan Critical Illness Cover Pays out in the event of death or terminal illness ( ICK) ( ICK) ( ICK) ( ICK) ( ICK) ( ICK) ( ICK) ( ICK) Pays out in the event of critical illness ( ( ( ( ( Pay out Lump Sum Lump Sum Lump Sum Lump Sum Lump Sum Monthly Benefit Monthly Benefit Monthly Benefit Maximum age for buying a plan 77 years 74 years 67 years 64 years 64 years 64 years 64 years 64 years Minimum length of the plan 1 year 5 years 2 years 5 years 5 years 5 years 5 years 5 years Maximum length of the plan 40 years 40 years 40 years 40 years 40 years 40 years 40 years 40 years Your plan must end before age Guaranteed* or Reviewable** Premiums Guaranteed Guaranteed Guaranteed or Reviewable Guaranteed or Reviewable Reviewable Guaranteed Guaranteed or Reviewable Reviewable The minimum age to take out a plan is 18. The plan must not end before your 29th birthday. * Guaranteed Premiums stay the same for the length of your policy, unless you make changes to your policy. ** If you select Reviewable Premiums, your premiums are reviewed every five years and may go up, go down or stay the same. If you can t afford the new premium you may need to reduce the amount of cover to match what you can afford. Your state of health is not a factor at review. 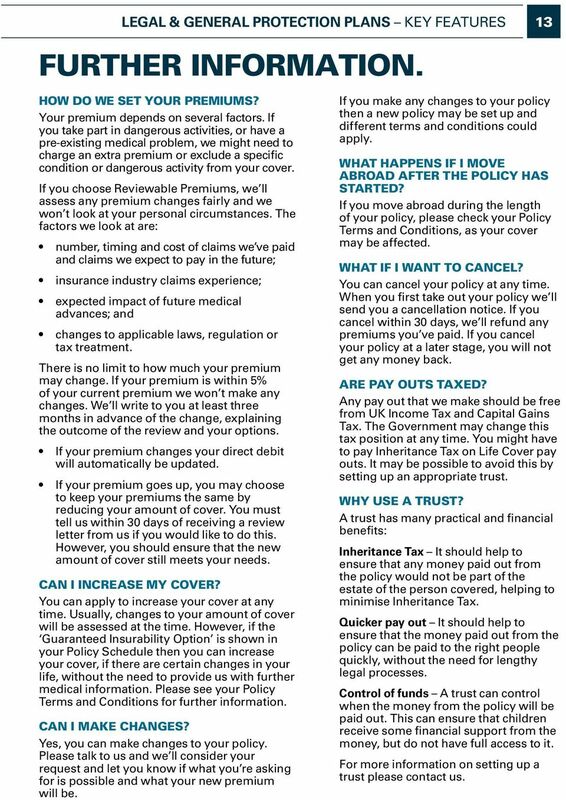 Please see the Policy Terms and Conditions if you would like further information on how we review your premiums. 8 9 LEGAL & GENERAL PROTECTION PLANS KEY FEATURES EXTRA BENEFITS FOR MORTGAGE PROTECTION PLANS ONLY. The following benefits may be available if you take out a mortgage protection plan. Some of these benefits are subject to age and other restrictions. 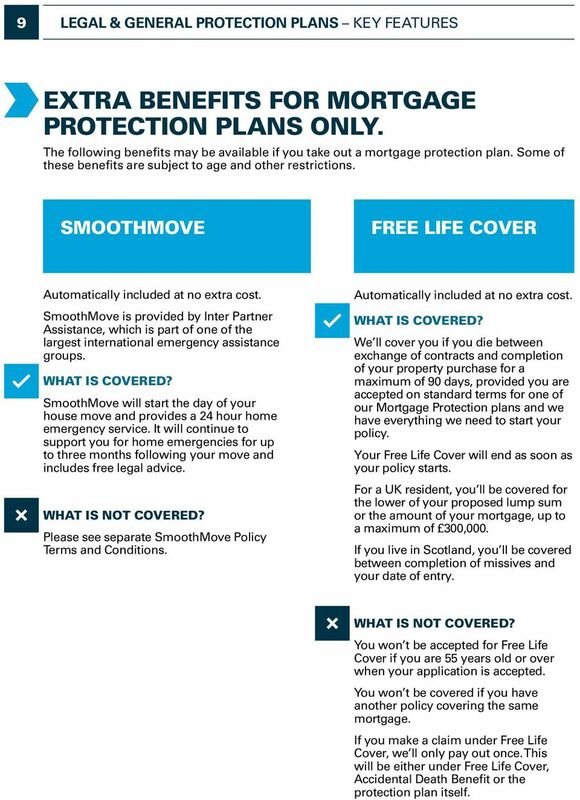 SMOOTHMOVE FREE LIFE COVER Automatically included at no extra cost. SmoothMove is provided by Inter Partner Assistance, which is part of one of the largest international emergency assistance groups. SmoothMove will start the day of your house move and provides a 24 hour home emergency service. It will continue to support you for home emergencies for up to three months following your move and includes free legal advice. Please see separate SmoothMove Policy Terms and Conditions. Automatically included at no extra cost. We ll cover you if you die between exchange of contracts and completion of your property purchase for a maximum of 90 days, provided you are accepted on standard terms for one of our Mortgage Protection plans and we have everything we need to start your policy. Your Free Life Cover will end as soon as your policy starts. For a UK resident, you ll be covered for the lower of your proposed lump sum or the amount of your mortgage, up to a maximum of 300,000. If you live in Scotland, you ll be covered between completion of missives and your date of entry. You won t be accepted for Free Life Cover if you are 55 years old or over when your application is accepted. You won t be covered if you have another policy covering the same mortgage. If you make a claim under Free Life Cover, we ll only pay out once. This will be either under Free Life Cover, Accidental Death Benefit or the protection plan itself. 10 LEGAL & GENERAL PROTECTION PLANS KEY FEATURES 11 WHAT IS TOTAL AND PERMANENT DISABILITY? We ll cover you for the loss of physical or mental ability, due to an illness or injury, to do either your own occupation or at least three of the six Specified Work Tasks listed below ever again. The definition that applies to you will be shown in your Policy Schedule and will depend on your occupation, employment status and whether you are paid for your work. Specified Work Tasks Walking The ability to walk more than 200 metres on a level surface. Climbing The ability to climb up a flight of 12 stairs and down again, using the handrail if needed. Lifting The ability to pick up an object weighing 2kg at table height and hold for 60 seconds before replacing the object on the table. Bending The ability to bend or kneel to touch the floor and straighten up again. Getting in and out of a car The ability to get into a standard saloon car, and out again. Writing The manual dexterity to write legibly using a pen or pencil, or type using a desktop personal computer keyboard. 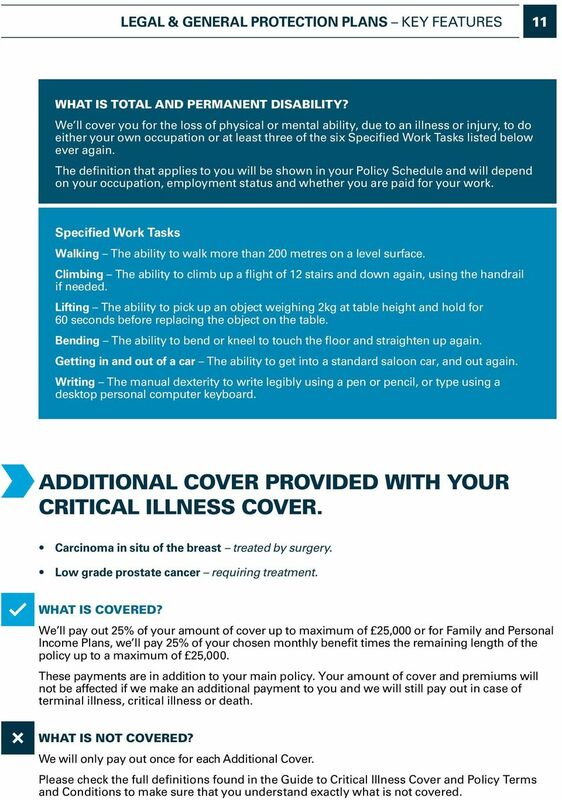 ADDITIONAL COVER PROVIDED WITH YOUR CRITICAL ILLNESS COVER. Carcinoma in situ of the breast treated by surgery. Low grade prostate cancer requiring treatment. We ll pay out 25% of your amount of cover up to maximum of 25,000 or for Family and Personal Income Plans, we ll pay 25% of your chosen monthly benefit times the remaining length of the policy up to a maximum of 25,000. These payments are in addition to your main policy. Your amount of cover and premiums will not be affected if we make an additional payment to you and we will still pay out in case of terminal illness, critical illness or death. We will only pay out once for each Additional Cover. 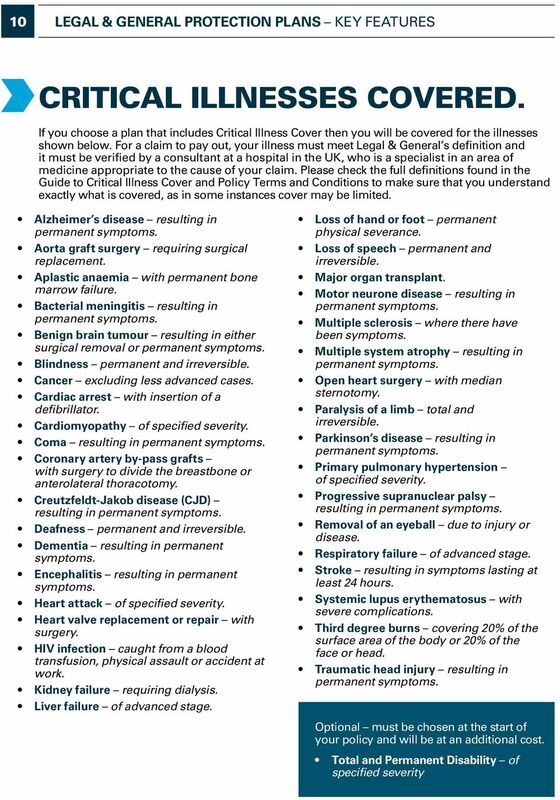 Please check the full definitions found in the Guide to Critical Illness Cover and Policy Terms and Conditions to make sure that you understand exactly what is not covered. 11 12 LEGAL & GENERAL PROTECTION PLANS KEY FEATURES WHAT EXTRA BENEFITS ARE INCLUDED WITH YOUR CRITICAL ILLNESS COVER? CRITICAL ILLNESS COVER FOR YOUR CHILDREN We will cover a relevant child* or any children you have in the future if, before the end the policy, they re diagnosed with one of the critical illnesses we cover, including Additional Cover (except Total and Permanent Disability). They are covered from when they re 30 days old to their 18th birthday (or 21st birthday if they re in full-time education). For a valid claim, we ll pay out 50% of your amount of cover up to a maximum of 25,000. Or if you have chosen one of our Family and Personal Income Plans, we ll pay 60 times your chosen monthly benefit up to a maximum of 25,000. These payments are in addition to your main policy. Your amount of cover and premiums will not be affected if we make an additional payment to you. We ll pay out one claim per relevant child* under your policy. Once two claims in total have been made, children s cover will end. If you have more than one Critical Illness policy with us, we ll pay out an overall maximum of 50,000 for that child. Your children will not be covered for: Total and Permanent Disability. Any condition that was present at birth. Where the symptoms arose before the relevant child* was covered. If death occurs within 14 days of diagnosis of one of the critical illnesses that we cover. * Relevant child a natural child, legally adopted child or stepchild of the person covered, who is at least 30 days old and younger than 18 (21 years old if in full-time education). 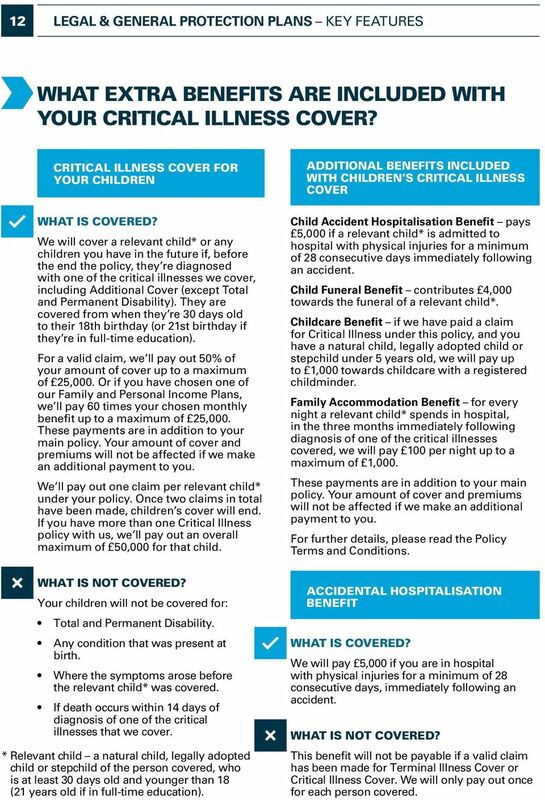 ADDITIONAL BENEFITS INCLUDED WITH CHILDREN S CRITICAL ILLNESS COVER Child Accident Hospitalisation Benefit pays 5,000 if a relevant child* is admitted to hospital with physical injuries for a minimum of 28 consecutive days immediately following an accident. Child Funeral Benefit contributes 4,000 towards the funeral of a relevant child*. Childcare Benefit if we have paid a claim for Critical Illness under this policy, and you have a natural child, legally adopted child or stepchild under 5 years old, we will pay up to 1,000 towards childcare with a registered childminder. Family Accommodation Benefit for every night a relevant child* spends in hospital, in the three months immediately following diagnosis of one of the critical illnesses covered, we will pay 100 per night up to a maximum of 1,000. These payments are in addition to your main policy. Your amount of cover and premiums will not be affected if we make an additional payment to you. For further details, please read the Policy Terms and Conditions. ACCIDENTAL HOSPITALISATION BENEFIT We will pay 5,000 if you are in hospital with physical injuries for a minimum of 28 consecutive days, immediately following an accident. This benefit will not be payable if a valid claim has been made for Terminal Illness Cover or Critical Illness Cover. We will only pay out once for each person covered. 12 LEGAL & GENERAL PROTECTION PLANS KEY FEATURES 13 FURTHER INFORMATION. HOW DO WE SET YOUR PREMIUMS? Your premium depends on several factors. If you take part in dangerous activities, or have a pre-existing medical problem, we might need to charge an extra premium or exclude a specific condition or dangerous activity from your cover. If you choose Reviewable Premiums, we ll assess any premium changes fairly and we won t look at your personal circumstances. The factors we look at are: number, timing and cost of claims we ve paid and claims we expect to pay in the future; insurance industry claims experience; expected impact of future medical advances; and changes to applicable laws, regulation or tax treatment. There is no limit to how much your premium may change. If your premium is within 5% of your current premium we won t make any changes. We ll write to you at least three months in advance of the change, explaining the outcome of the review and your options. If your premium changes your direct debit will automatically be updated. If your premium goes up, you may choose to keep your premiums the same by reducing your amount of cover. You must tell us within 30 days of receiving a review letter from us if you would like to do this. However, you should ensure that the new amount of cover still meets your needs. CAN I INCREASE MY COVER? You can apply to increase your cover at any time. Usually, changes to your amount of cover will be assessed at the time. However, if the Guaranteed Insurability Option is shown in your Policy Schedule then you can increase your cover, if there are certain changes in your life, without the need to provide us with further medical information. Please see your Policy Terms and Conditions for further information. CAN I MAKE CHANGES? Yes, you can make changes to your policy. Please talk to us and we ll consider your request and let you know if what you re asking for is possible and what your new premium will be. If you make any changes to your policy then a new policy may be set up and different terms and conditions could apply. WHAT HAPPENS IF I MOVE ABROAD AFTER THE POLICY HAS STARTED? If you move abroad during the length of your policy, please check your Policy Terms and Conditions, as your cover may be affected. WHAT IF I WANT TO CANCEL? You can cancel your policy at any time. When you first take out your policy we ll send you a cancellation notice. If you cancel within 30 days, we ll refund any premiums you ve paid. If you cancel your policy at a later stage, you will not get any money back. ARE PAY OUTS TAXED? Any pay out that we make should be free from UK Income Tax and Capital Gains Tax. The Government may change this tax position at any time. You might have to pay Inheritance Tax on Life Cover pay outs. It may be possible to avoid this by setting up an appropriate trust. WHY USE A TRUST? A trust has many practical and financial benefits: Inheritance Tax It should help to ensure that any money paid out from the policy would not be part of the estate of the person covered, helping to minimise Inheritance Tax. Quicker pay out It should help to ensure that the money paid out from the policy can be paid to the right people quickly, without the need for lengthy legal processes. Control of funds A trust can control when the money from the policy will be paid out. This can ensure that children receive some financial support from the money, but do not have full access to it. For more information on setting up a trust please contact us.